Awesome Seats Between Home Plate and Red Sox on Deck Circle. 5 and 10 packs available. Each 10 pack includes a Yankees game. I have put down $104 per ticket which is average price for single game tickets - they range form $71 - $137 per ticket per game. I let buyers choose tickets on a 1st come basis, with 10 packs getting aYankees game. Once the games are chosen then will calculate actual cost for each game. Have done this in the past and works out well, also we make it easy to flip tickets amongst ourselves if something comes up and you cannot make the game. I accept paypal as well for payment. I can send actual tickets if you want as well. Big Pap - nice view ! Do you sell just a few games? Traveling today. But have a few games left and we can absolutely work with you. Hi Mark, I'm only looking for 4 tickets to the game on 5/24. i have the weekend package for two seats B126 row HH seats 3-4 to swap or buy the tickets outright from you. I'd be happy to swap any games you may need in the future as well. Sorry those dates are gone. Keep us in mind next year ! Karen, I have some games left for Section 120 - Let me list those and then List Section 150 . 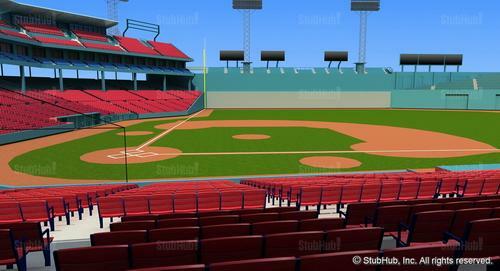 Section 150 Row LL Seats 1-4 (3rd base side) 9	4/28/2015	Tuesday	6:10 PM	$76 $304 Blue Jays at Red Sox 15	5/5/2015	Tuesday	7:10 PM	$76 $304 Rays at Red Sox 22	5/24/2015	Sunday	3:33 AM	$109 $436 Angels at Red Sox 34	6/16/2015	Tuesday	4:05 PM	$102 $408 Braves at Red Sox 37	6/25/2015	Thursday	1:35 PM	$109 $436 Orioles at Red Sox 63	8/21/2015	Friday	7:10 PM	$116 $464 Royals at Red Sox 72	9/7/2015	Monday	1:35 PM	$109 $436 Blue Jays at Red Sox 81	9/27/2015	Sunday	3:33 AM	$109 $436 Orioles at Red Sox Then for Section 120 Row MM, Seats 1-4 (1st base side) 69	9/4/2015	Friday	7:10 PM	$109 $436 Phillies at Red Sox Not sure what exactly you are interested in, but if you buy All I will give you also a Yankees game to choose. This is an imperfect system but it has worked well for me this year for a couple of new partners. As I get partners at the beginning fo the year we can do a better draft. So let me know. ok 5 games, 4 tix each games 33, 49, 56, 66, and 78. I will submit offer now. Michael - I am sorry I have been traveling so that is part of the delay. During that period someone else bought those tickets. So I am out for Loge 120. I will have some Loge 150 and when I do I can try and contact you over the next week. Sorry about this. Here is a list of what I have left. I am ok with 5 games of 4 people or at least 20 tickets (have some games of 2 available. 4 seats : 33	6/15/2015	Monday	7:10 PM	$102 $408 Braves at Red Sox 49	7/27/2015	Monday	7:10 PM	$102 $408 White Sox at Red Sox 51	7/29/2015	Wednesday	7:10 PM	$109 $436 White Sox at Red Sox 56	8/14/2015	Friday	7:10 PM	$116 $464 Mariners at Red Sox 77	9/23/2015	Wednesday	7:10 PM	$76 $304 Rays at Red Sox 78	9/24/2015	Thursday	7:10 PM	$76 $304 Rays at Red Sox Choose 1 yankee game - 13	5/3/2015	Sunday	3:33 AM	$142 $568 Yankees at Red Sox 66	8/31/2015	Monday	7:10 PM	$142 $568 Yankees at Red Sox 67	9/1/2015	Tuesday	7:10 PM	$142 $568 Yankees at Red Sox Games with just 2 seats : 79	9/25/2015	Friday	7:10 PM	$109 $218 Orioles at Red Sox 41	7/7/2015	Tuesday	7:10 PM	$109 $218 Marlins at Red Sox Sorry for the format. If you are interested we need to exchange an offer so we can move ahead. I am very flexible about making sure we can work with your requirements. Yes. I will get you games shortly tonight. Mark, Do you still have games available for sale? Thanks for the information Mark...do you basically do a first come-first serve basis for game selection or is it done via a draft with the different partners of the share? I'd be interested in getting a share of 10-20 games on behalf of the company I work for. Given we'd be using the tickets with clients, we'd love if we were able to get mainly weekday games - would that be possible? Many thanks! Good afternoon, Interested in purchasing 10game pack which would include one Yankees game. Is there a listing of available games to choose from that are still available? The offer sheet didn't list. Yes - the list is in a spreadsheet not sure how to send. You woul be 3rd partner so still large selection. I try to balance weekday and weekend (Friday/Sat/Sun) to a 6:4 ratio. These seats are great only my 2nd year with them and last year was late to get them. Only one Yankees called for so far.